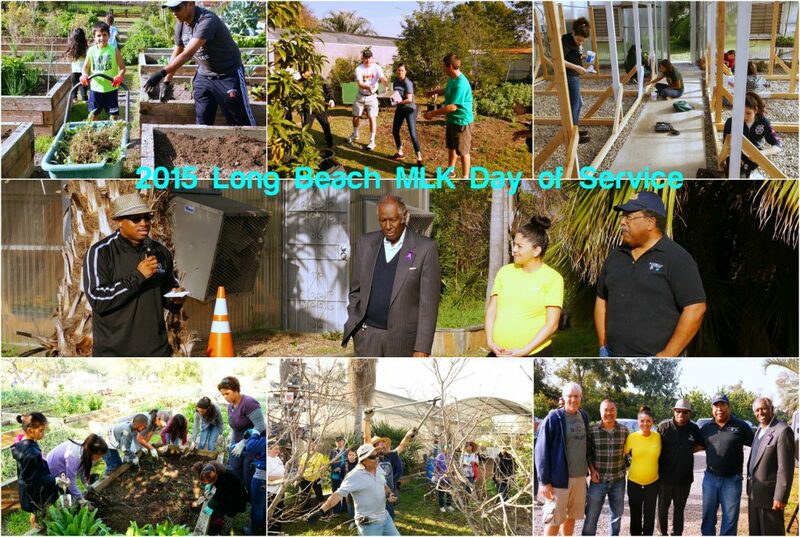 Join us to make it a “Day On, not a Day Off,” on Monday, January 21 as part of the MLK National Day of Service in Long Beach. 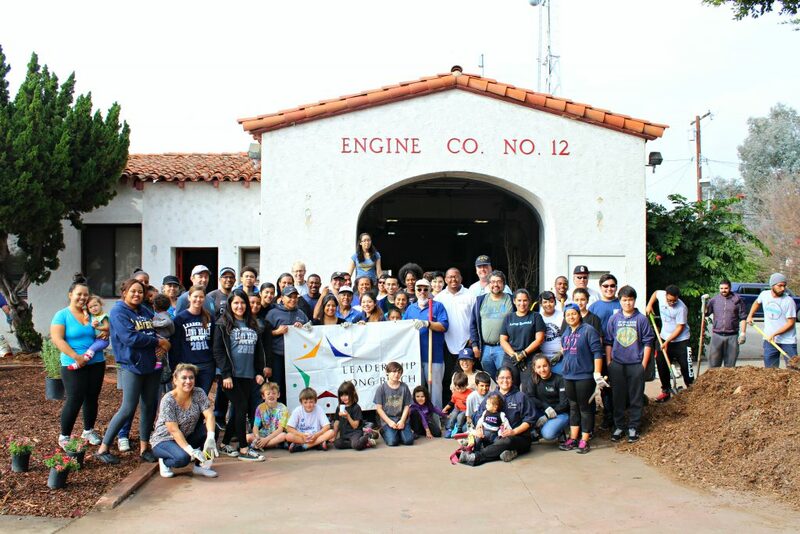 There are 16 service projects coordinated by Leadership Long Beach and supported by the Office of Mayor Robert Garcia, Councilman Al Austin, Councilman Rex Richardson, the Port of Long Beach and a host of civic and community organizations. Join us at Scherer Park, corner of Del Amo Blvd and Atlantic Avenue in Bixby Knolls, for our kickoff rally and MLK celebratory remembrance at 8 AM. We will have a pancake breakfast and beverages before we begin our short program. We want all volunteers to attend to confirm their volunteer project site information and we will send you to your site by 9 AM. Please review the project descriptions/requirement and sign up for your service activity. Please review any physical requirements or skills needed. Also, please review our waiver form as part of the registration. There are some sites that can accept same day volunteers. Volunteers will work with the Maye Center to build a garden that will serve as a means of therapy to the community. The work involved will entail pulling weeds, building potato planters, building a garden including ponds, arts and crafts such as painting on the fence, drawing, creating garden signs and planting flowers. Volunteers will work with Gladys Avenue Urban Farm to provide food access and production to low income community members. Under direction, volunteers will design a garden which will include weeding, planting 15 different vegetables, building farm stands, arts and crafts with painting and drawing art on walls, designing workspace and community farm stand, building irrigation and safe space for pre-school children to learn about growing, harvesting and planting organic veggies. Volunteers will be involved with playground and park cleanup. Looking for 20 more volunteers. Volunteers will assist in cleaning up beach and parking lot area at Junipero Beach. Volunteers will assist the 8th District Council office in cleaning up the corridor along Long Beach Blvd. Duties include picking up trash, pulling weeds and sweeping the corridor. Volunteers will assist the 8th District Council office in cleaning up the corridor along Atlantic Avenue. Duties include picking up trash, pulling weeds and sweeping the corridor. Volunteers will assist the 8th District Council office in cleaning up the corridor along Orange Avenue. Duties include picking up trash, pulling weed and sweeping the corridor. Volunteers will help Habitat for Humanity and community members beautify the area of Washington Neighborhood where middle school students walk and play on a daily basis. Volunteers will assist in cleaning around the park, school and alleys surrounding the school. Project Host: Readwrite Educational Solutions, Inc. Volunteers will do a deep clean of the playground, combing the sand and picking up trash around the park. Some light cleaning and maintenance of classroom; replacing vinyl adhesive on two classroom tables, deep cleaning classroom chairs and window cleaning (inside and outside). Volunteers will plant remaining plot at Houghton Park Valor Plaza and general cleanup of Houghton Park. Volunteers will plant grape and berry vines, 32 mini-vegetable plots and remove two 8-foot tall dead trees. Dead trees to be sawed up and given away as firewood. Volunteers will remove debris, trash and discard large items from as many alleys as possible. Volunteers will be involved in planting new plants in 12 raised beds as well as moving and spreading mulch. Volunteers will be involved in park grounds and outdoor cleanup. 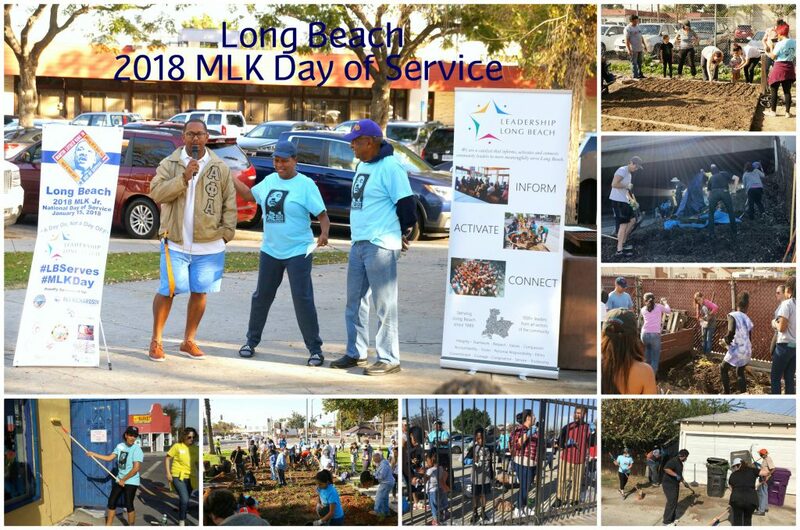 This has been the eighth year that Leadership Long Beach has collaborated with other community and civic organizations and groups to make it a “Day On, not a Day Off” on the MLK National Day of Service in Long Beach. 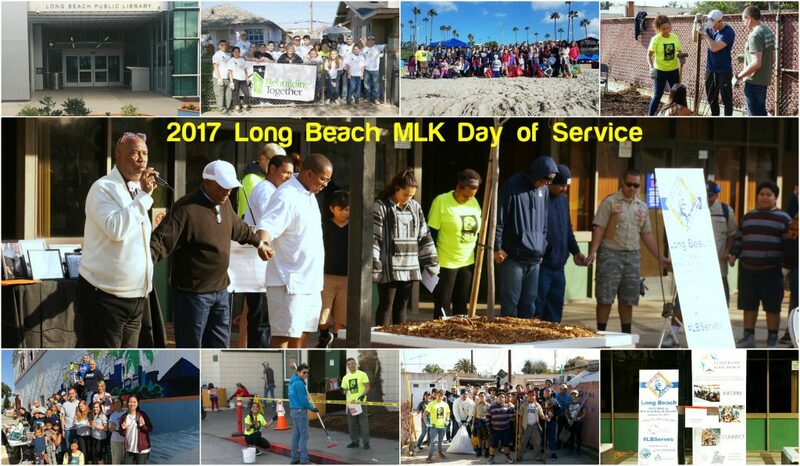 We are proud to work with these great organizations and groups and are greatly pleased to continue to have an impact on making Long Beach a better place to live through our involvement in this annual activity. 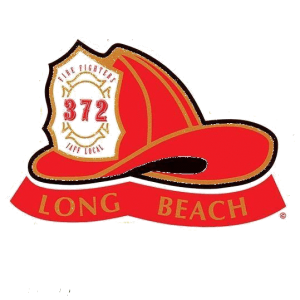 We are fortunate to have alumni, family and friends support us through this project and continue to make a difference in the neighborhoods of Long Beach.